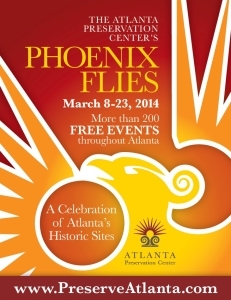 Easements Atlanta Participates in Phoenix Flies | Easements Atlanta, Inc. The Atlanta Preservation Center’s Phoenix Flies: A Celebration of Atlanta’s Historic Sites, March 7-23, 2014, will feature events presented by Easements Atlanta, Inc. (EAI), among other local historic attractions. As EAI revels in its 30th year, we will be host to not just one event but three events this year. This unique annual program gives the public access to hundreds of free events at historic sites important to Atlanta’s past, present and future. Guided walking tours, bicycle tours, exhibits and lectures are among this year’s 230 free events. A full listing of events is posted on the Atlanta Preservation Center’s website, but here’s a preview of the events (x3) hosted by EAI. Opening, Friday, March 7, 6-9 pm: To commemorate the 30th anniversary of the incorporation of Easements Atlanta, Inc., the non-profit organization commissioned Judith Pishnery of Pisconeri Studio to create dynamic images of the forty historic properties protected by historic preservation easements held by EAI. From over 500 images, a curated selection of the resulting work will be on exhibit at the Drawing Room Gallery. Select framed prints are available for purchase from EAI. Gallery Hours: Monday-Friday, March 10-14 & March 17-21, 10 am-2 pm and by appointment: 404-688-3353 ext. 16. The Drawing Room Gallery is in the APC’s Grant Mansion. Sunday, March 9, 1 pm: At this photography workshop, you’re invited to learn from Judith Pishnery, professional photographer and SCAD-Atlanta professor, how to capture the beauty, craftsmanship, and visual narrative of architecture in an engaging way. With the Architectural Gifts Exhibit as a backdrop, you’ll explore the basics of camera settings, composition, seasonal considerations, and adjustments for natural lighting. The hour-long workshop will be held in the Drawing Room Gallery. Thursday, March 13, 11 am: Join Executive Director Angela Threadgill for a discussion about historic preservation easements and how its donation may be used as a tax incentive for developers and property owners of historic properties. You’ll learn program basics, applicable tax deductions, and case studies. The hour-long lecture will be held in the Drawing Room Gallery. Free on-street parking is available. Please consider carpooling. The venue is accessible to individuals with physical disabilities.